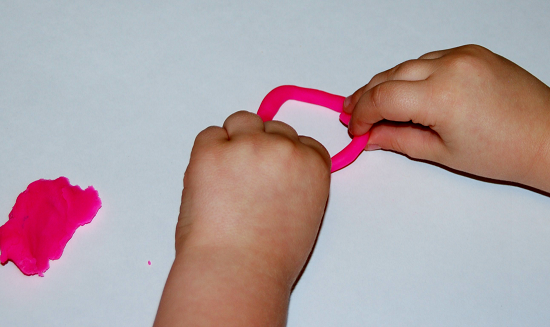 Simple Playdough Shapes Building Challenge for Preschoolers! Knowledge of shapes is one of the earliest educational processes that young kids are exposed to. Preschoolers use visual information about shapes to discriminate between objects and to learn about the world around them. This week the Early Childhood Education Team is offering playful learning suggestions for helping young kids learn about SHAPES. The playdough shapes building challenge below will not only help preschoolers observe and compare various shapes, but it will challenge them to integrate basic shape knowledge into a hands-on activity that encourages critical thinking skills. 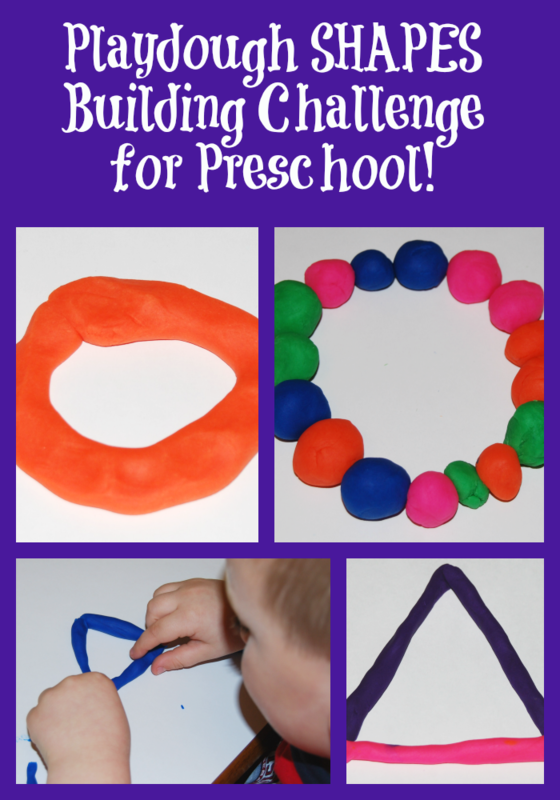 Playdough SHAPES Building Challenge for Preschoolers! BUILDING INQUIRY: What basic shapes can the children create using ONLY playdough? The shapes building challenge can be modified for kids of various ages through the addition of more complex shapes, polygons, cylinders/cones/spheres, or creating towers from basic shapes. Rolling, squeezing, squishing, and molding playdough into various shapes is a FUN way to offer opportunities for the development of fine motor skills and knowledge of shapes through inquiry and solution-based learning! Introduction for students: Review basic shapes the children have had introduced or are learning: circles, triangles, squares, rectangles are good shapes to begin with. 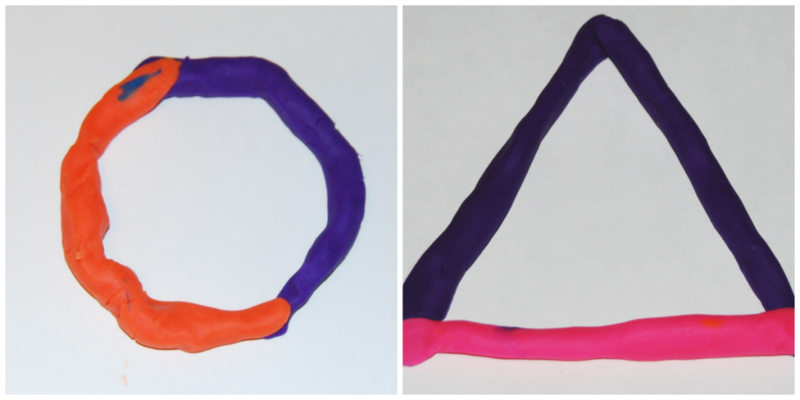 Challenge the children to use playdough only to create any shape(s) they know. The children will ask questions about how to make the shapes. Try to guide the children with open-ended questions that will allow them to think about the shape they wish to create and make a plan for the design with only the playdough. It is exciting to observe kids engaged in planning, building, making visual “measurements”, and formulating ideas about various shape designs! In the photo above, kids chose to create an 8-sided octagon and a 3-sided triangle from rolled pieces of playdough. To create circles, the kids tried various designs. Some of the children rolled a long playdough worm and then attached the ends. Other children chose to roll small balls and flatten with their hands. One group “pieced together” a large circle comprised of other small playdough balls. It’s amazing the observe young children thinking and creating. This challenge was FUN for the kids, but they gained some important problem solving skills that they will carry with them as they grow and learn about shapes! « Preschool Science: Exploring Eye Colors in Families! This is a fantastic to challenge kids to think! What a fun way to explore shapes! We love using play dough! I love all of the creative ways your students made shapes. Your suggestion to respond to questions with open ended questions instead of telling them how to make the shapes is wonderful! My son is obsessed with play dough! He’ll love this idea! Great challenge! I love that you encouraged your students to think critically about how to make the shape. It’s neat to see the various ways they made the circle! So fun! I’m going to add this to our lessons next week. My kids love play dough work! Play dough is such an amazing and versatile learning tool! Great challenge. I like how it invites them to get creative and solving a problem.